So, I decided to try the Mexican chopped salad with crunchy tortilla strips Jen of Jen Loves Kev posted on her blog awhile back. There is a ton of chopping and prep work involved, so it’s not a meal to take on if your hands are hurting. But the outcome is delicious. I used fresh sweet white corn that I chopped off the cob, and it really made the salad. 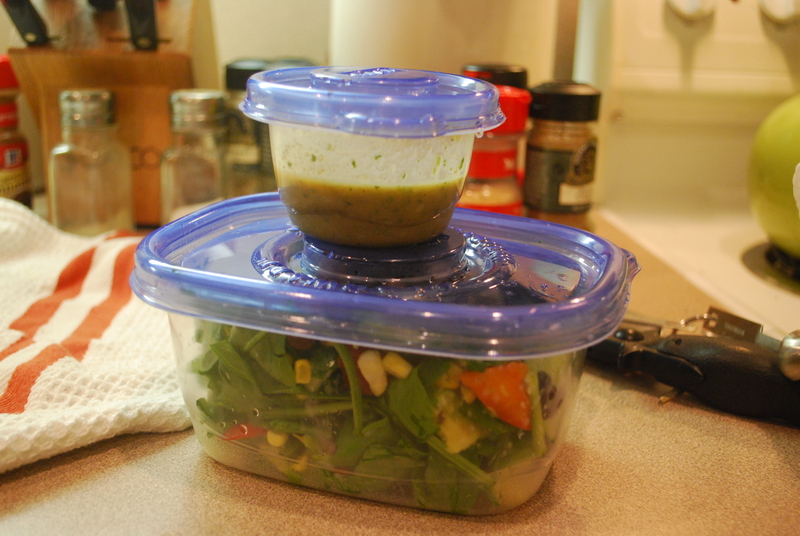 I doubled the amount of dressing made, and if there’s any left over, it will make an amazing marinade later in the week. Tim put some chicken he’d made up earlier in the week and some goat cheese crumbles and he said it tasted really yummy as a non-vegetarian salad that way. 1. To make the tortilla strips: Preheat oven to 350*. Brush the tortillas with the canola oil. Cut in half, then into 1/4-inch strips. (I used a pizza roller for this, and it was super easy.) Spread on a baking sheet and sprinkle with salt and chili powder. Bake for 10 to 15 minutes. 2. To make dressing: Heat olive oil, cumin, coriander, garlic, salt and sugar in a saucepan on low heat for two to three minutes. Blend remaining ingredients with oil mixture in a blender or food processor until smooth. 3. 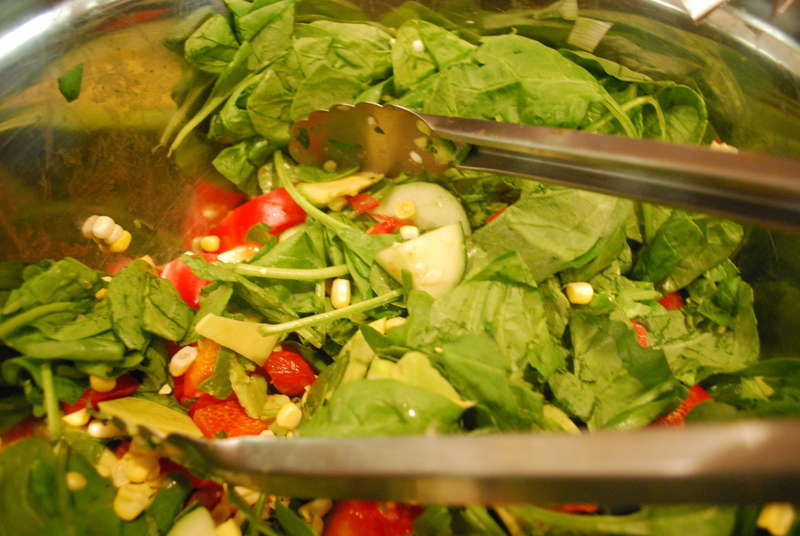 Combine everything and toss the salad with the dressing. It was super tasty and pretty easy, too. I’m super excited about the leftovers I get to bring to work tomorrow (as you can see). I’m noticing now that I’ve made the jump back into being a vegetarian that I’m cooking more — and enjoying cooking, too. I like seeking out recipes that appeal to me, sure, but I’m also on the lookout for those that I could easily turn into a non-vegetarian dish for the mister. It’s an interesting challenge, but I’m definitely liking it. So, I would love to hear your vegetarian recipes! What have you found works and what doesn’t?